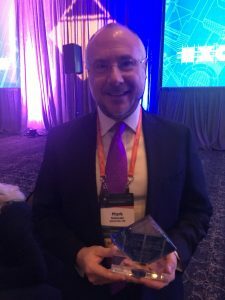 Bluewater’s Mark Debinski was honored by TTI Success Insights as the recipient of the Bill Brooks IMPACT Award at the TTI Success Insights’ International Conference in Scottsdale, Arizona. TTI presented the award to Mark for his commitment and contributions to the industry and the TTI network. The late Bill Brooks was a true TTI advocate and lifetime supporter of those who shared his devotion for sales training. His many accomplishments included the development of the IMPACT Selling System.